EPSON environmental protection printing process: imported knitted cotton embroidery, thickened more soft, quilted car computer encryption technology is more durable, non slip bottom high density fiber cloth can be washed. Soft and breathable for superior comfort you instantly feel at home. It's the best choice as Birthday, Christmas, New Year and all Holiday gifts. Size: 57"*77"; Thickness: 0.7"inch. 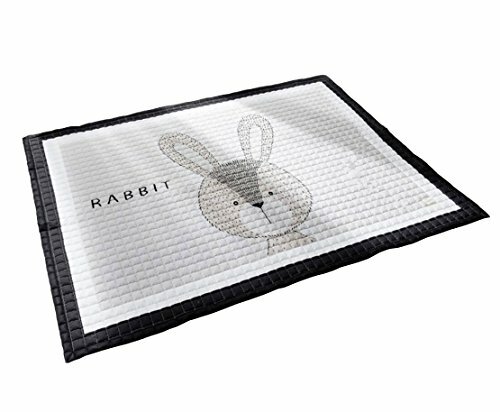 kids' favorite mat - Designed like a play-mat, which can be used as a storage bag. Anti Slip Cloth Bottom Fabric (Reverse side is random color: pink/white). Soft floor surface for babies and children to play, ideal for encouraging crawling, rolling, sitting up, and learning to walk. It ensures a soft landing for rolling, tumbling, and falls. Make kids more fun to sleep.Perfect play carpet for bedrooms, playrooms, classrooms, travel, speech therapy, or rainy days at home. Ultimate for keeping toys organized at home. If you have any questions about this product by LAGHCAT, contact us by completing and submitting the form below. If you are looking for a specif part number, please include it with your message.